Whether B2B or B2C marketing, reviews are all around you. 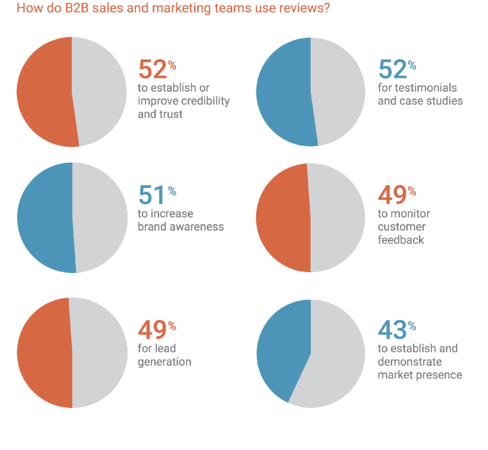 Are you using reviews in your B2B marketing strategy? If not, the data says it's time to start. In Autumn of 2017, G2 Crowd and Heinz Marketing conducted a study to determine how both B2B buyers and sellers utilize consumer reviews. The results of the 2018 Benchmark Report, the Impact of Reviews on Buyers and Sellers, remain in line with other statistics about customer reviews. 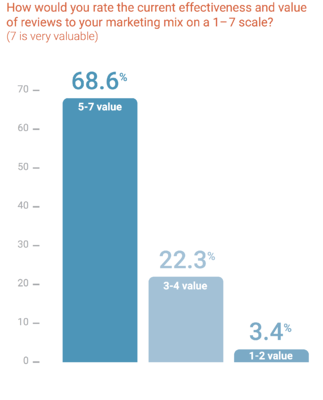 The report conclusively shows the influence review sites have on B2B purchases. This study on business company reviews is unique in two ways. First, the report’s focus is on business-to-business (B2B) purchases, rather than the business-to-consumer (B2C) product reviews that you often see on Amazon, Yelp, and TripAdvisor. Second, while many studies look at the experience consumers have with review websites, this study also measures the impact of reviews on B2B marketing and sales effectiveness. Here we will explore each of these takeaways and the statistics behind it, followed by actionable steps you can take for your B2B marketing and sales strategy. Takeaway #1 - While trusted product reviews drive B2B purchase intent, many B2B marketers do not use them. 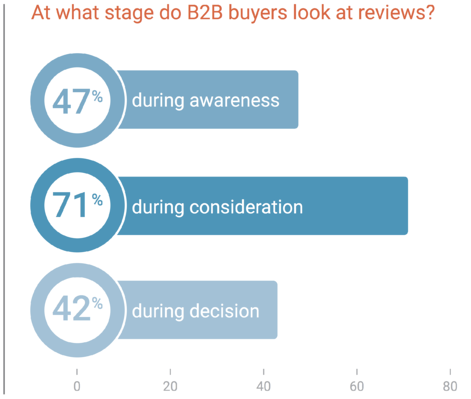 Consumer reviews increase purchase intent among B2B buyers. 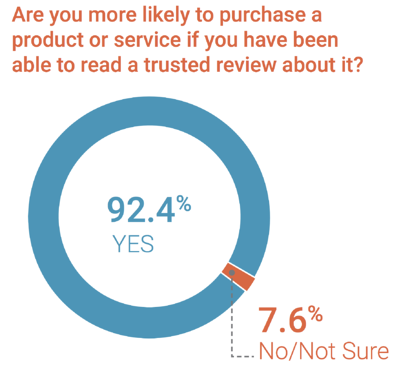 When asked “Are you more likely to purchase a product or service if you have been able to read a trusted review about it?” 92.4% of respondents answered yes, with 5.5% answering “don’t know/not sure,” and only 2.1% answering no. 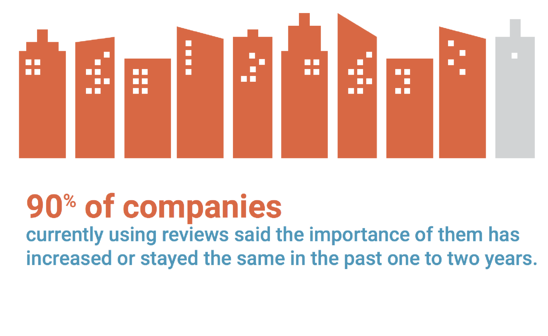 However, only one out of five B2B companies are currently using reviews of their company in their marketing strategy. 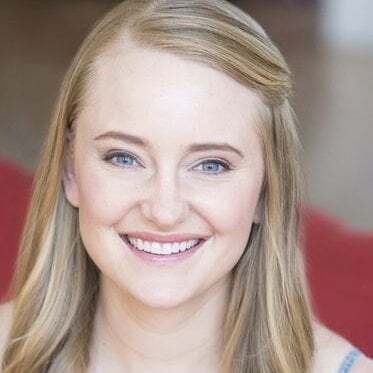 In addition, of the companies not utilizing website reviews, only 19.9%, or one in five companies, are considering adding them into their marketing mix. 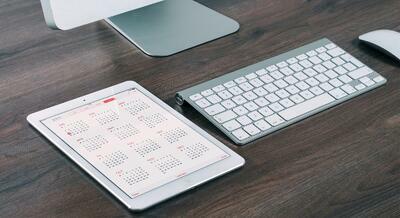 TIP: Are you a B2B software or service provider? Join companies like yours connecting to millions of active buyers on G2 with user reviews. Creating your profile is free and takes just five minutes. 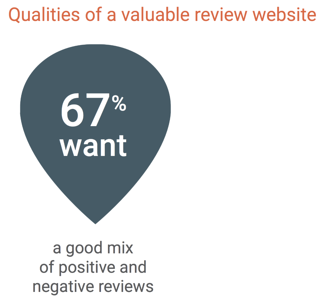 Takeaway #2 - B2B businesses using review websites know their value. B2B marketing teams already using business reviews know their effectiveness, and rank them as a very valuable part of their marketing mix. 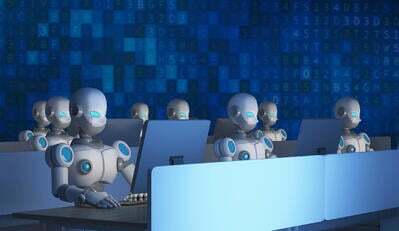 In fact, of those utilizing product reviews, 68.6% rated them as an effective and valuable part of their business to business marketing mix, giving a score of 5, 6, or 7 on a scale from 1 - 7. Less than 10% of respondents gave the use of reviews a score of 2 or 3, with only 3.4% answering with a rating of 1 or 2. Not only that, the importance of using those product review sites has increased. Of the B2B companies utilizing customer reviews, 69.9% said their importance has increased, with 18.6% reporting the level of importance stayed the same. Put together, they equal almost 90%, or 9 out of 10 companies, at which consumer reviews have maintained or increased in their importance. A mere 3.4% of respondents said the importance of using company reviews had decreased, while 8.4% didn’t know or weren’t sure. Product reviews were also shown to be an emerging tool for B2B businesses. B2B companies are using website reviews in a wide range of activities. The areas in which businesses are utilizing customer reviews include gaining trust and credibility, monitoring customer feedback, establishing market presence, increasing brand awareness, for lead generation, and for case studies and testimonials. Takeaway #4 - Consumer reviews aren't funnel specific. Survey participants were asked at what stage of the buyer’s journey they look at website reviews, with the option to choose all that apply. The results showed the majority of B2B buyers, 71%, look at product reviews during the consideration phase of purchases. However, online reviews are also used in the awareness/discovery phase, showing their importance throughout the funnel. How many people trust a business more after reading positive online reviews? Takeaway #5 - Recency and quantity are both essential on business review sites. If your company is using product review sites, know that B2B buyers trust companies with recent reviews and a significant number of them. Of the B2B buyers reading product reviews, 61% would like to see 11-50 reviews. Quantity is not the only factor to consider – trusted reviews also need to be recent. 65.7% of B2B buyers find reviews very valuable when they were written within the past three months or less. 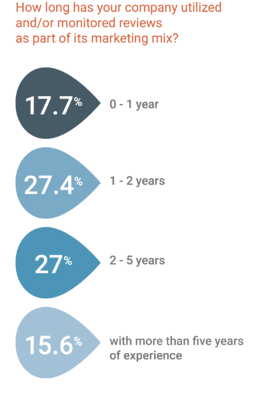 The number drops by 20% if reviews are 3 – 6 months old. If your online reviews are more than six months old, only 21% of buyers will find them valuable. Takeaway #6 - Negative reviews are not a deal-breaker. Negative reviews are not as problematic as you might think. In reality, 67% of B2B buyers prefer to see a good mix of positive and negative reviews on a business review site. 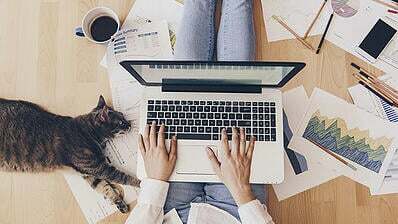 This statistic is reinforced in a consumer reviews study by the Spiegel Research Center, who found that purchase likelihood peaks with online reviews at the 4.0 – 4.7 star rating, not 4.7 – 5.0 stars. Not only do buyers want that mix, people trust negative reviews. 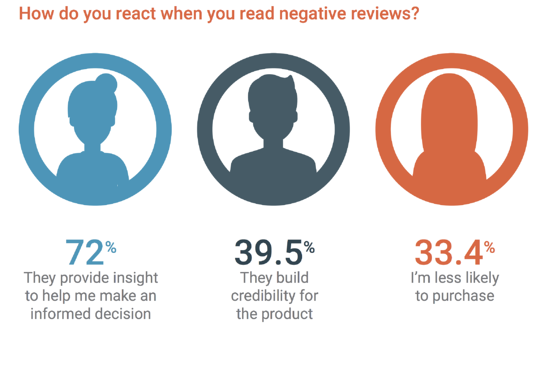 In fact, 72% of buyers say that negative reviews on products and services help provide depth and insight to make a decision, and another 39.5% say they build credibility for the product. Only 33% of buyers are less likely to purchase when they see a negative review. Having all positives creates skepticism. This is backed by Revoo, who found that 95% of people suspect website reviews have been censored or are fake when there are no bad scores. Many professionals have experienced firsthand the influence credible reviews have when making company purchases. However, those same businesses are missing the opportunity to use customer reviews in their marketing and business plans. Those who add reviews to their marketing mix are likely to gain a competitive advantage, especially if they do so before their competitors. TIP: Start getting B2B reviews now with a free G2 profile. If you are a B2B marketer, start by finding out if your product or service is already receiving reviews on G2. If so, claim your profile and begin monitoring and responding to reviews. If not, you can add your product or service to G2 -- it's absolutely free! Once you have started a consumer review strategy, it is imperative to continually seek out new reviews. Companies who have a high number of customer reviews, as well as recency in them, will get the most benefit from business review sites. Implement a continual review campaign. Ask for reviews on your email signature, through email and phone outreach, or in-person conversations. Whenever a customer gives you positive feedback, ask them to share it in the form of a review. However, you should ask everyone for product reviews, not only your best customers. Don’t be afraid of negative reviews; people trust them. Plus, by knowing how to respond to negative reviews, you can turn the adverse into an advantage. Use online reviews in your marketing and sales collateral. Find ways to do so in every step of the buyer’s journey, with an emphasis on the consideration stage. Include business reviews in both printed and digital content, and do so throughout the sales funnel. Find out what tools are offered on your company’s review sites. Many websites (including G2 Crowd) offer widgets to embed trusted reviews directly into your website and landing pages. For more about B2B marketing, read the G2 Crowd guide to B2B marketing strategies and tactics. You can also learn additional ways to utilize customer reviews in your marketing mix. G2 Crowd and Heinz Marketing, in partnership with OnTarget Consulting and Research, conducted a survey in Autumn 2017. 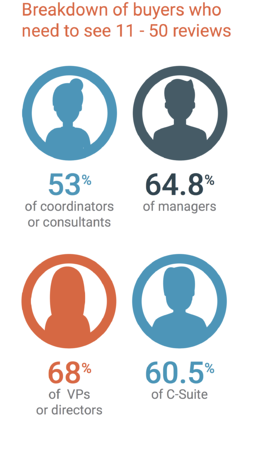 Respondents included 548 business professionals across a range of industries and business sizes, from SMB to enterprise companies. Download the full report on B2B reviews in the G2 vendor resource center.